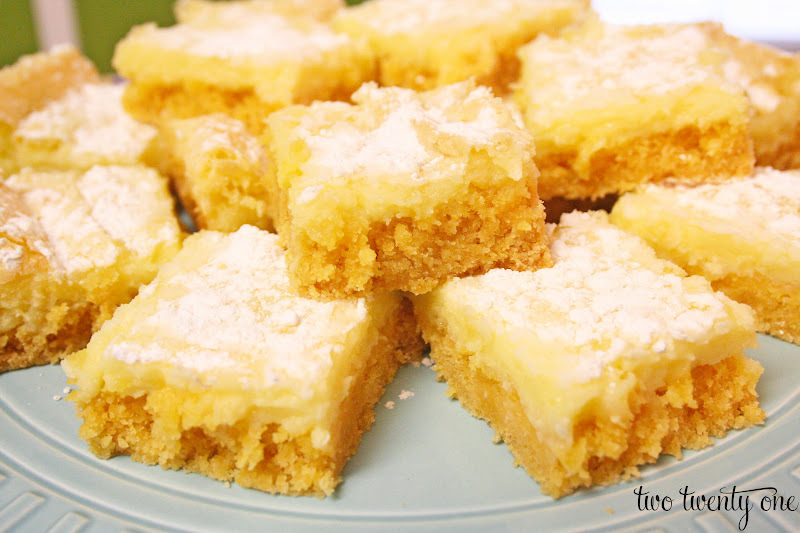 Buttery Cream Cheese Bars, Yum! My mom has been making these since, well, forever. As a child I hated them. As an adult, I love them! They’re so rich, buttery, and cream cheesey. 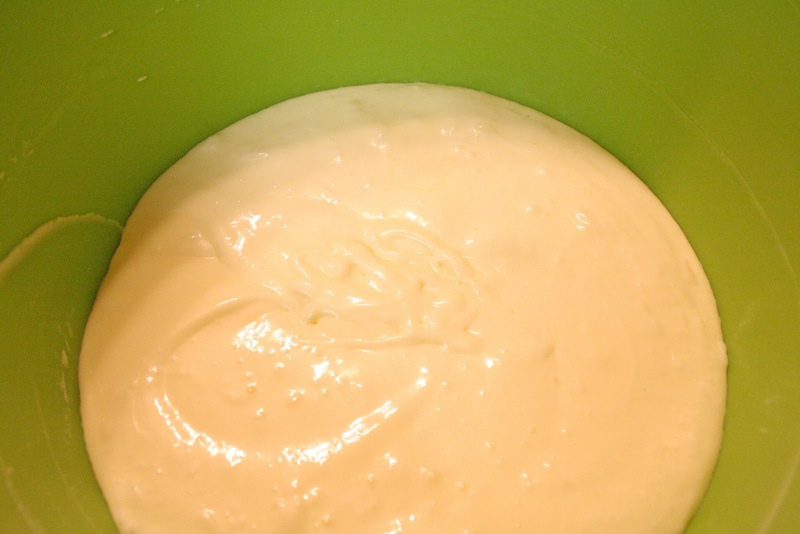 Yep, that’s a word/phrase– cream cheesey. Better yet, they’re super easy to make! Paula Deen makes something quite similar called Ooey Gooey Butter Cake, and it’s pretty much the same recipe. 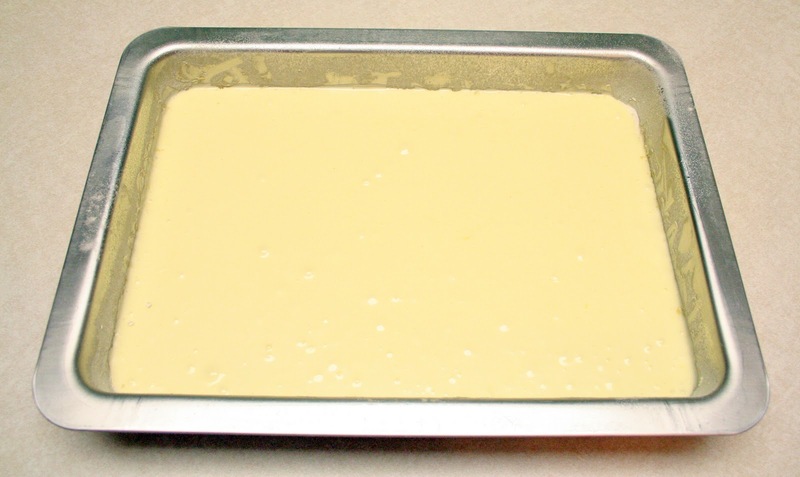 But I knew about my mom’s buttery cream cheese bars first, so they were invented first in my book. 🙂 Love ya, Paula! 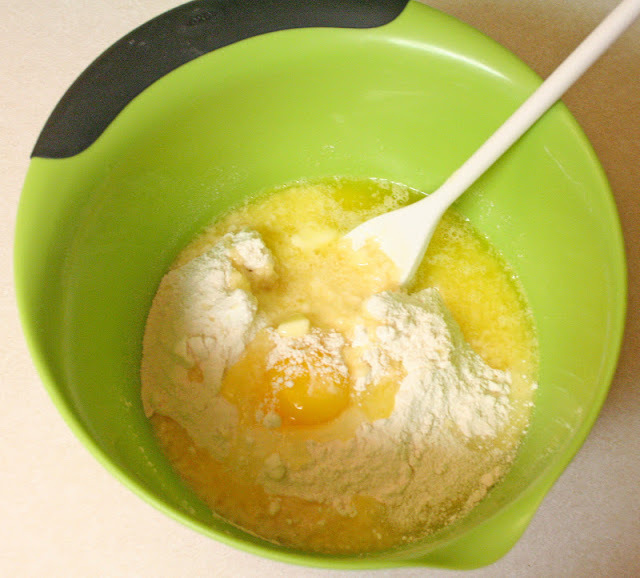 Mix together the yellow cake mix, 1 stick of melted butter, and 1 egg. 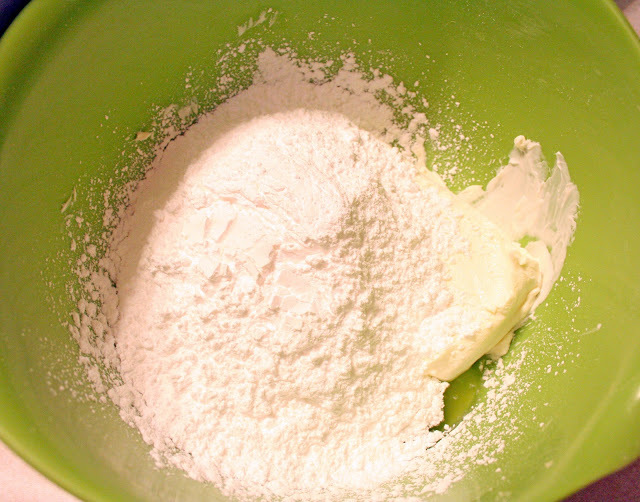 Press the crust mixture into a greased and floured 9×13 pan. Your end result should look like this. Bake for 35-40 minutes or until light brown. 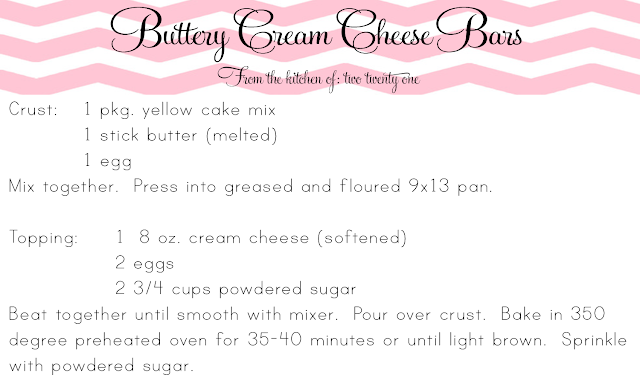 I even created a handy-dandy 3×5 recipe card for you! Click on the recipe card to download it. whuuuttt? what a unique recipe. cake mix and cream cheese? i can’t even imagine how these taste! which may be the sign that i need to make them. 🙂 i’m pretty sure i have all of the ingredients on hand as well! this is why weight watchers devloped bonus points lol cant wai to try it! yikes! these look sinful and totally on my weekend to-make list:) Love your cake stand, too! This sounds WAY too yummy!! Can’t wait to try out this recipe!! I think I could live on those! That looks incredibly good. Thanks for sharing it at my Swing into Spring party. Please stop back and grab a party button to add to your post when you get a chance…thanks. Those sound so good and really different from anything I’ve tried … I’m bookmarking now! Can’t wait to try them … thanks for sharing! Wow…seriously drooling here. I’m going to be trying these yummy gems! oh my gosh. how much do i have to pay you to bring me some of these like right now. haha. they look SOOO yummy!!! Hi I am a new follower and cant wait to read more. Stop by and visit me any time. 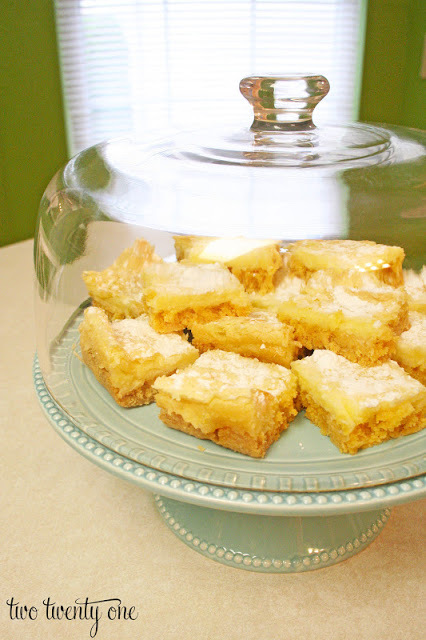 These look so good and would be the perfect way to use up the yellow cake mixes I have in my pantry! Thanks for the recipe and the cute card!! You had me at buttery. And cream cheese. 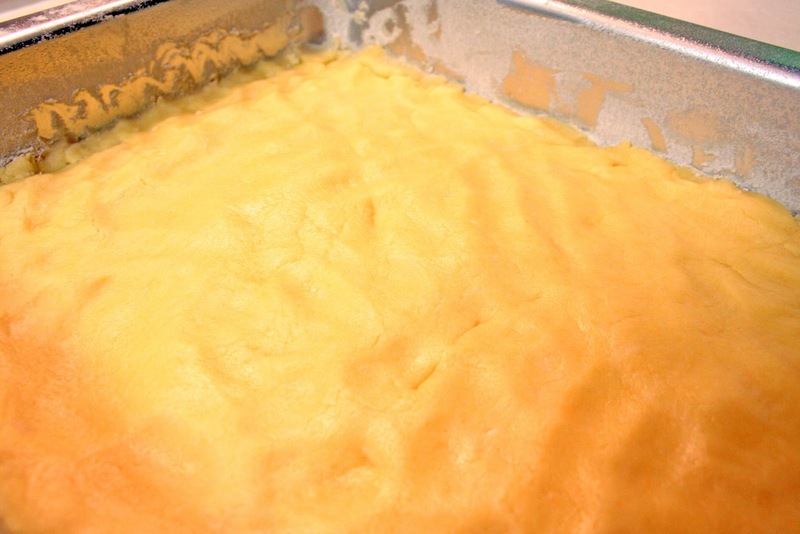 OOOH, ooey gooey butter cake! My husband grew up with these, and I recently tried my hand at them-and burned the crust! Totally embarrassing! But practice makes perfect right? Yes please! I love anything with cream cheese. YUM. Those look absolutely delicious! I am definitely making these! Thanks for the recipe! Ooops didn’t mean to delete! Uh, can you say yum!! I am a sucker for anything with cream cheese in it and this sounds so delicious. Thanks for sharing! This looks delicious. I think I will make these tomorrow for a BBQ my family is going to. I also love the handy dandy recipe card you made. so thoughtful and so cute! Just wanted to let you kn ow I am anew follower. Your blog is too cute! Mmmm! I can’t wait to try this- thanks! Thanks for the recipe and the step by step tutorial, can’t wait to try out these yummy treats! Loving your blog! I love these. The recipe I have also calls for a stick of butter in the filling. I notice your recipe doesn’t. 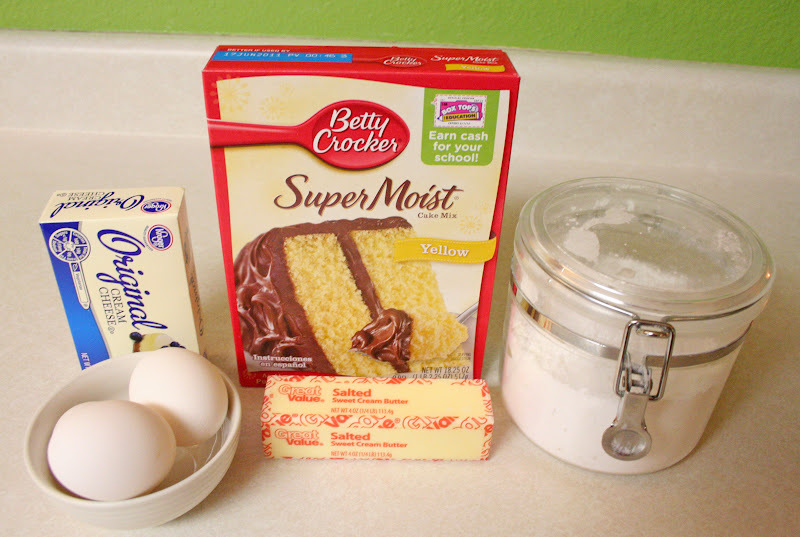 I’m going to make some today and use a lemon cake mix and add some lemon juice in the filling. Found you and following you from one of the blog parties. What a wonderful bar recipe! Got it saved to make in a few days! Hope you can stop by, follow if you can, and share a great recipe post on my weekend blog hop too! Bye for now! aaaaah yum! these sound fantastic!! Oh. my. gosh. I think I just died and went to heaven. And also maybe shorted out my keyboard from the drool. 😉 YUM!!! Done and done. I am SO making these. And the best part? I am in charge of dessert for Easter dinner this year! Hey! Where did you get that cutie-patootie cake plate? Love!